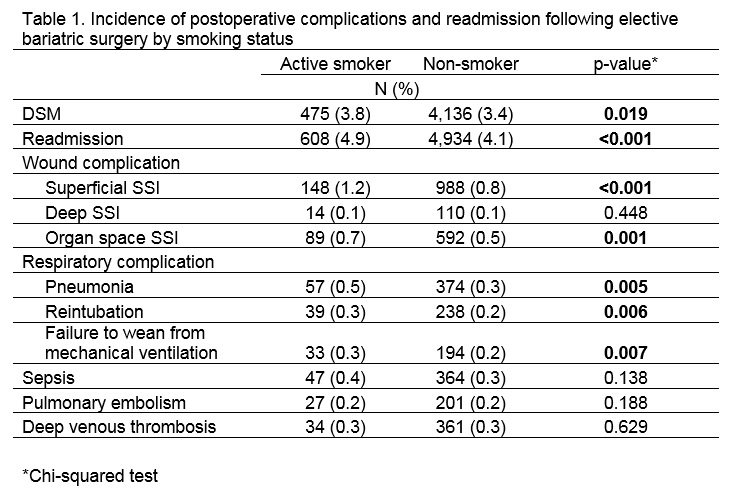 The link between smoking and poor postoperative outcomes is well established. Despite this, active smokers are still offered elective bariatric surgery. We describe the risk of postoperative 30-day complications and readmission following laparoscopic sleeve gastrectomy (LSG) and laparoscopic Roux-En-Y gastric bypass (LRYGB) in active smokers. The American College of Surgeons National Surgical Quality Improvement Program (ACS NSQIP) database was queried to identify all elective LSG and LRYGB from 2012 to 2017. Patient outcomes were compared based on smoking status. Smoking status was classified as active smoker based on patient self-report of smoking within the last year. Primary outcomes included 30-day readmission and death or serious morbidity (DSM). Secondary outcomes included wound [defined as superficial, deep and organ space surgical site infection (SSI)] and respiratory [pneumonia, reintubation and failure to wean from mechanical ventilation within 48 hours] complications. Multivariable logistic regression was used to determine the association between smoking status and measured outcomes. Of the 133,417 patients who underwent elective bariatric surgery, 12,424 (9.3%) self-reported as active smokers. On univariate analysis, active smokers more frequently experienced DSM, hospital readmission within 30-days, superficial SSI, organ space SSI, pneumonia, reintubation, and failure to wean from mechanical ventilation (Table 1). On multivariable analysis, the likelihood of DSM (OR 1.13 [95% CI 1.01-1.26]), readmission (OR 1.21 [95% CI 1.10-1.33]), wound complications (OR 1.44 [95% CI 1.24-1.68]), and respiratory complications (OR 1.69 [95% CI 1.34-2.14]) were greater in patients who smoke. The adjusted ORs remained significant on subgroup analysis of LSG and LRYGB patients, with the exception of DSM in LRYGB (OR 1.04 [0.89-1.24]). Active smokers undergoing bariatric surgery experience significantly worse 30-day outcomes when compared to non-smokers. Tobacco smoking should be considered as an absolute contraindication to elective bariatric surgery.